So Dal is being sold @ 220/- per Kg. I have written enough articles lately as to how current Govt. has lost the plot completely. I don’t want to go into that today. Today I want to discuss the health aspect of expensive Dal. Thanks Ravish @ NDTV for bringing it to our attention. Dal is the main source of protein for most Indians. Most migrant workers (laborers, cycle rickshaw pullers, auto rickshaw drivers, watchmen etc. ), depend on road side stalls for daily food. They eat one time a day, heavy meal which costs them 30 bucks. The news report was of Delhi. But I have tried same meal in Mumbai too. It costs the same. 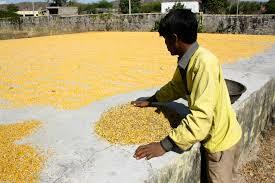 With the Dal price sky rocketing, the amount of Dal is decreasing and amount of water is increasing in the meal. Toor Dal was already away from reach. Now they don’t even use Moong Dal. A Mauth Dal is being used, which is the cheapest available in market and looks like Moong Dal; that too in decreasing quantity. This leaves us with less and less amount of protein in the poor man’s diet. What is the health aspect of it? Will it not make them weak? Will that weakness not result in less productivity? Will that make India better? I shudder to even think the horror of the empty stomach and weak shells of the poor. What is this if not cleansing of the poor? Just like Congress was accused of eradicating poor and not poverty; current times are equally dreadful. Next time you see poor laborers, rickshaw drivers, watchmen a bit lean and weak, do offer them a Dal-Rice meal. They need proteins too.